Tools in Koha all perform some sort of action. 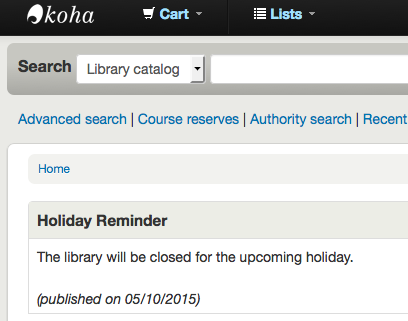 Often many of the items listed under Tools in Koha are referred to as ‘Reports’ in other library management systems. 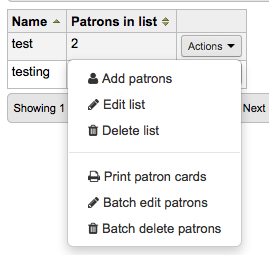 Patron lists are a way to store a group of patrons for easy modification via the batch patron modification tool or reporting. Enter a list name and save the list. Each list has an ‘Actions’ menu with more list options. To add patrons to the list click the ‘Add patrons’ link in the ‘Actions’ menu. 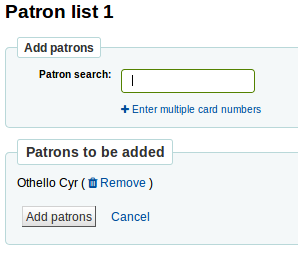 Enter the patron’s name or cardnumber in the search box and click on the right result to add the patron. 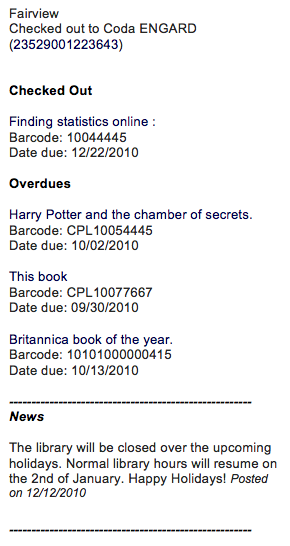 Alternatively, you can click on the ‘Enter multiple card numbers’ link and scan (or type in) barcodes in the box. Once you have all of the patrons you would like to add you can click the ‘Add patrons’ button to save them to the list. Patron clubs create clubs which patrons may be enrolled in. It is useful for tracking summer reading programs, book clubs and other such clubs. Important Staff will need permission to edit clubs, templates and enroll patrons. Go to your staff members account tab and click on the More drop down menu. Select Set Permissions and make sure patron clubs have checkmarks next to each of the functions you want your staff to have. Remember if your staff is a superlibrarian, they will have the permission. Name is required. This could be something like Adult Book Club, Children’s Book Club or Summer Reading Program. Remember these templates will be starting point for each club you create. Require valid email address: if this box is checked only patrons with a patrons with a valid email address can enroll. So they will need a email address to enroll. The library drop down gives you the flexibility to enroll patrons from specific branches. If you let it set to blank, all branches will be able to enroll. Club Fields: these fields will be used when creating a club based on this template you can connect authorized values here Enrollment Fields: you can add any additional fields you want to have filled out by your patrons like you can connect authorized values here. Creating a new club based on a template Here you can add information about a new club using a template you created. Click on the New Club dropdown menu and select the template you want to use. Start and End date will depict when this club runs, the entire duration of the club. Once the club expires, it will be removed from the OPAC for users to enroll if that option is selected. To moderate comments click on the notification on the main dashboard or go directly to the Comments Tool and click ‘Approve’ or ‘Delete’ to the right of the comments awaiting moderation. 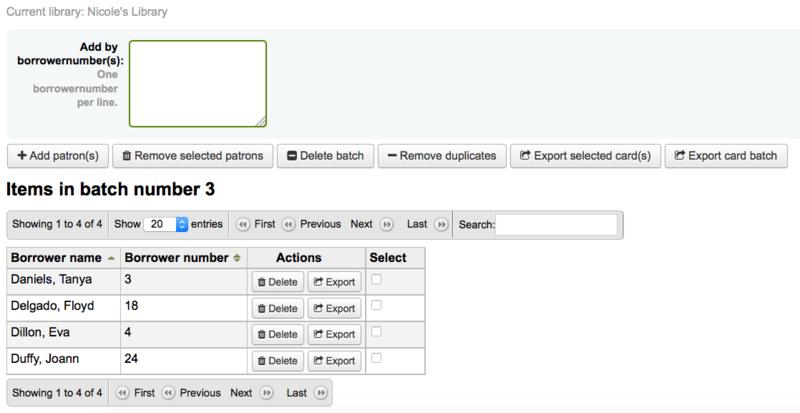 The patron import tool can be used at any time to add patrons in bulk. It is commonly used in universities and schools when a new batch of students registers. The ‘password’ should be stored in plaintext, and will be converted to a Bcrypt hash. Date formats should match your system preference, and must be zero-padded, e.g. ‘01/02/2008’. The fields ‘branchcode’, ‘categorycode’ and all fields you have defined in the BorrowerMandatoryField preference are required and must match valid entries in your database. If loading patron attributes, the ‘patron_attributes’ field should contain a comma-separated list of attribute types and values. The attribute type code and a colon should precede each value. This field must be wrapped in quotes if multiple values are defined. 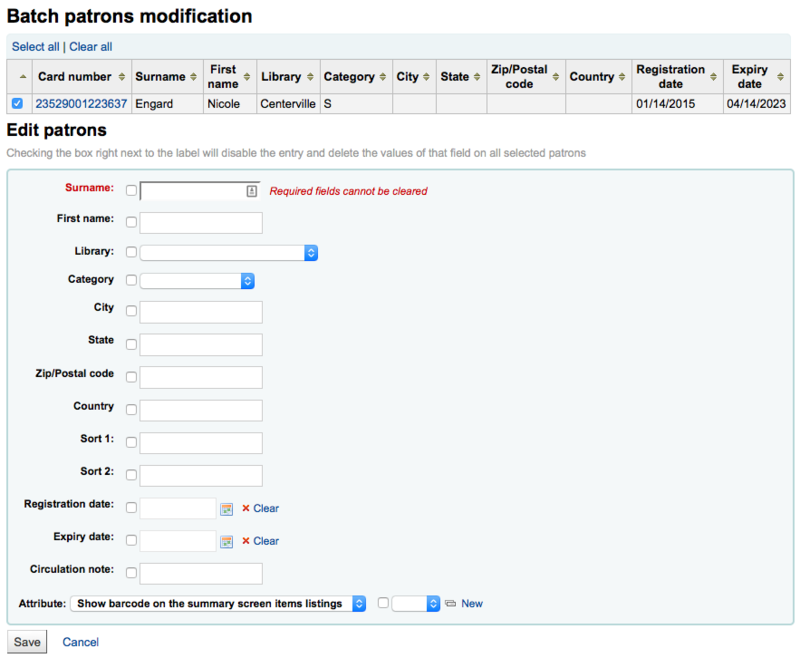 When replacing a patron record, any attributes specified in the input file replace all of the attribute values of any type that were previously assigned to the patron record. 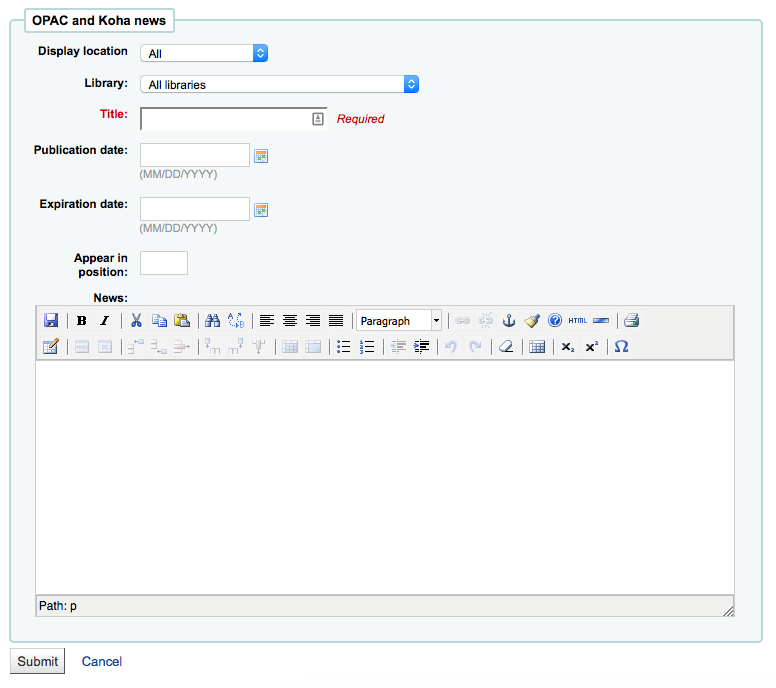 Once you have created your file, you can use the Patron Import Tool to bring the data into Koha. ex. If you’re importing patrons specific to one branch you can use the field on the Import form to apply the branch code to all those you are importing. Finally you need to decide on what data you want to replace if there are duplicates. If you included patron attributes in your file you can decide whether to add your values to existing values or erase existing values and enter only your new values. All notices and circulation receipts (or slips) generated by Koha can be customized using the Notices & Slips Tool. The system comes with several predefined templates that will appear when you first visit this tool. Each notice can be edited, but only a few can be deleted, this is to prevent system errors should a message try to send without a template. 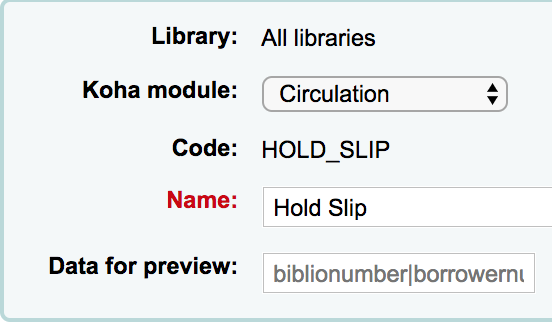 Each notice and slip can be edited on a per library basis, by default you will see the notices for all libraries. If you have a style you’d like applied to all slips you can point the SlipCSS preference to a stylesheet. The same is true for notices, using the NoticeCSS preference to define a stylesheet. You will also want to review the Customising Notices and Slips wiki page for more information on formatting these notices. Not all notices can be branch specific for more information review the Customising Notices and Slips wiki page. When working with the overdue notices you want each notice at each branch to have a unique code. 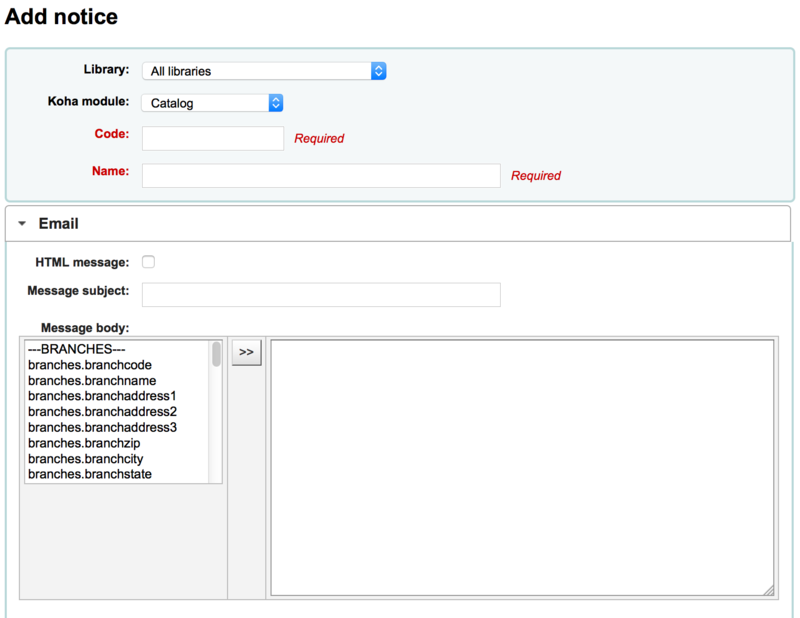 Think about using the branch code in front of the notice code for each branch. With overdue notices, be sure to put your branch name in the description as well so that it will be visible when setting up your triggers. In the message body feel free to type whatever message you feel is best, use the fields on the left hand side to enter individualized data from the from database. Review the Customising Notices and Slips wiki page for more information. On overdue notices make sure to use <<items.content>> tags to print out the data related to all items that are overdue. 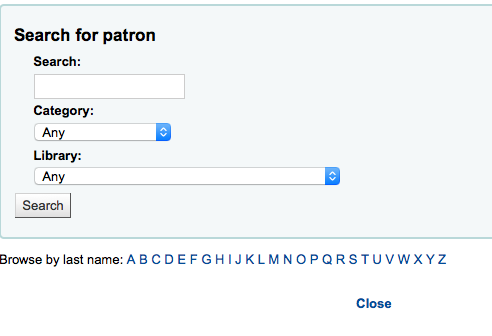 If you don’t want to print the patron’s full name on your slips or notice you can enter data in the Other name or Initials field for each patron and use that value instead. 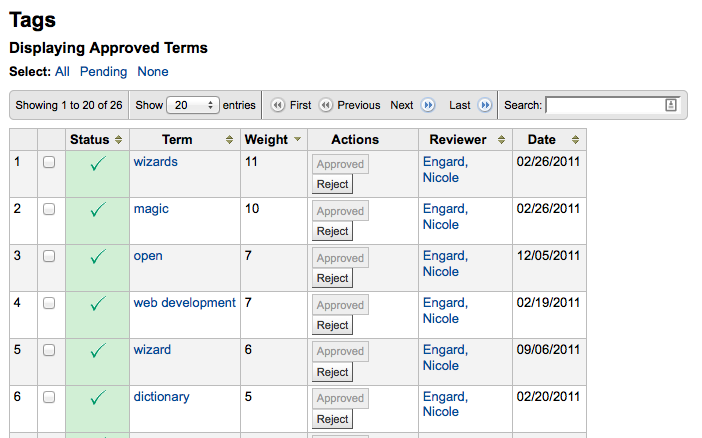 The system preference TranslateNotices will add tabs for each installed language to the notices editor. The notice defined in the ‘Default’ tab will be used if there is no preferred language set for a patron. 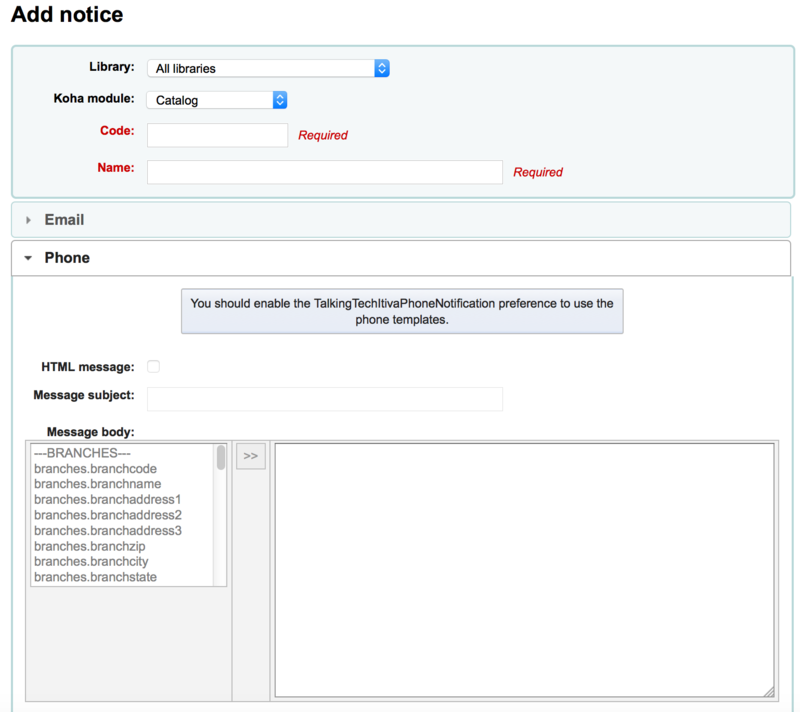 For some notices it is possible to preview the notice template showing how it would look to a specified patron for a particular item or record. Fill in the necessary information for the template then click the Preview button below the message body. The preview dialog will indicate if there are any problems generating the notice template preview. When creating your overdue notices there are two tags in addition to the various database fields that you can use in your notices. You will also want to review the Customising Notices and Slips wiki page for information on formatting item information in these notices. These new tags only work on the overdue notices, not other circulation related notices at this time. 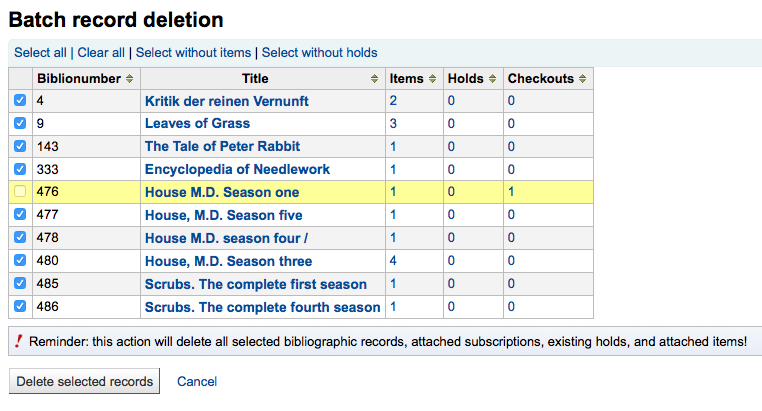 These tags are <item> and </item> which should enclose all fields from the biblio, biblioitems, and items tables. This notice is sent when a patron’s suggestion is accepted. Note: If you don’t want to send this notice, just delete it. Important: The notice will only be sent correctly if a username, password and email address is added to the patron record before saving it for the first time. The notice can’t be resend or triggered again after the patron account has been created. ACQCLAIM is the code of the sample notice, but it’s possible to define several notices choosing any code. Only the module ‘Claim aquisition’ will be taken into account. All notices with this module will appear in the pull down on the late orders page. The staff patron triggering the email has a valid email address. The vendor contact marked as ‘Contact about late orders?’ has a valid email address. 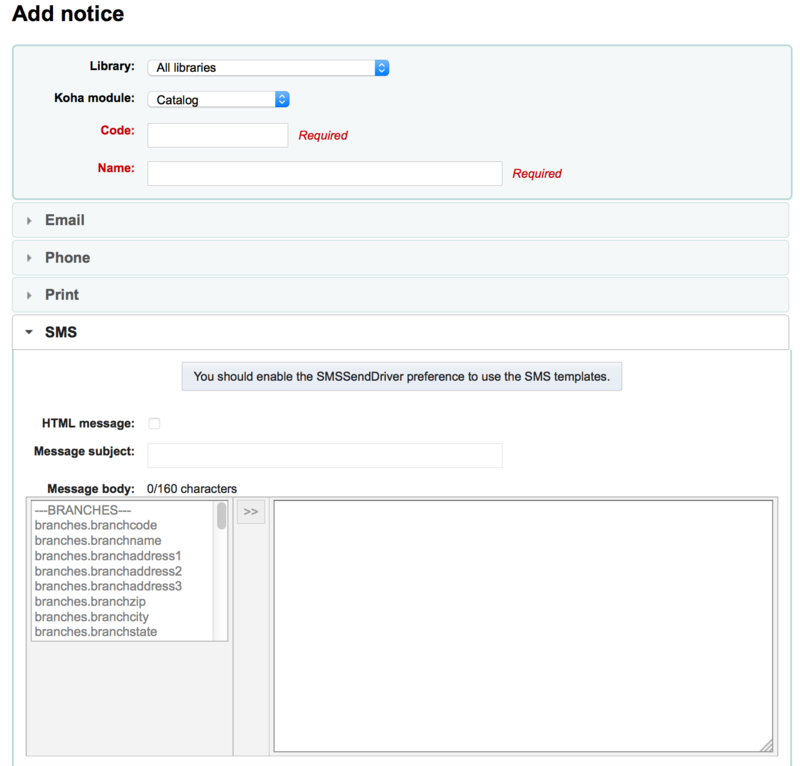 The notice is triggered manually from the basket summary page using the ‘Email order’ button in the toolbar. The vendor contact marked as ‘Primary acquisitions contact’ and ‘Contact when ordering’ has a valid email address. 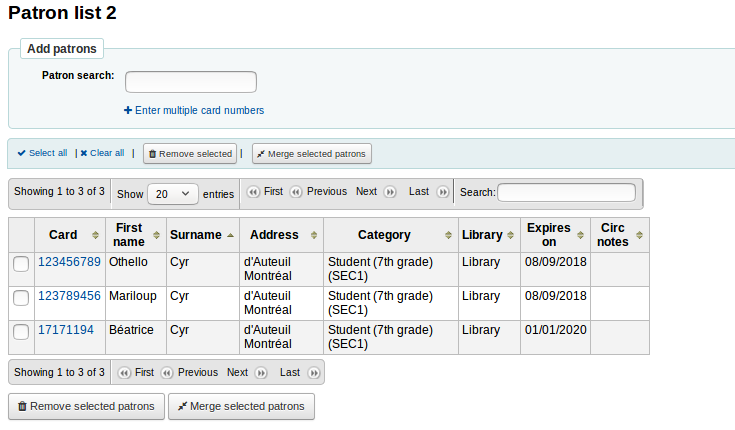 Used in the acquisition module to inform patrons on receiving orders they have been added to. This notice is sent to the patron when an article request is cancelled by staff. This notice is sent to the patron when an article request is marked as completed by staff. This notice is sent to the patron when an article request has been made in order to confirm the request. This notice is sent to the patron when an article request is marked as being processed by staff. This notice is sent to the patron who made a suggestion, when the order created from the suggestion is received. The discharge feature is controlled by the useDischarge system preference. When this notice references the branches table it is referring to the pickup branch information. This notice can be sent to patrons to warn them that their cards are expiring soon. Requires that you have the MembershipExpiryDaysNotice set and the related cron job set. This notice is sent to the patron who made a suggestion, when the ‘from a suggestion’ option is used to create an order from it. This notice is sent when a patron requests a new password from the OPAC in order to validate the email address. The password reset feature is controlled by the OpacResetPassword system preference. This notice is sent when a patron’s suggestion is rejected. Notice used in the serials module to notify patrons/staff of new issues of a serial. SERIAL_ALERT (RLIST in older verisons) is provided as a sample notice, but the notice code can be chosen freely as only the module is taken into account. Multiple notices can also be managed. You have the option to select the notice used to inform the patron about a received serial issue for a subscription. Choose from the ‘Patron notification’ drop down. If a notice has been selected for a subscription, patrons can subscribe to the email notification from the subscription tab in the detail view in the OPAC. 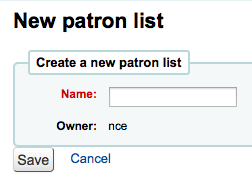 Used to notify a patron when another patron has accepted their shared list. Used to notify a patron that another patron would like to share a list with them. 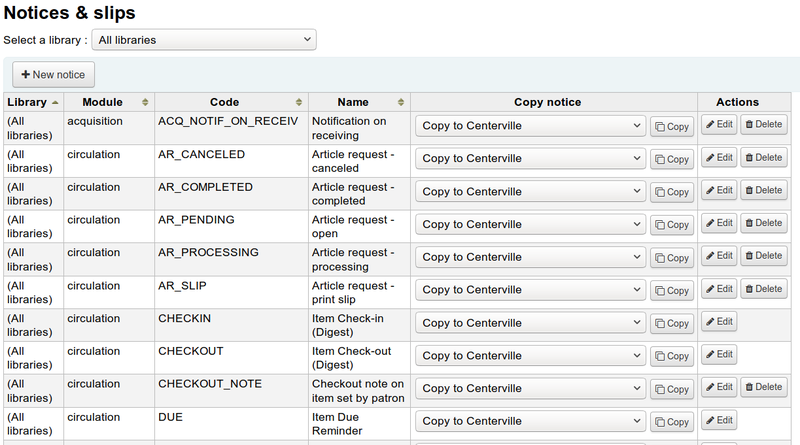 The slip or receipt can be printed manually when managing article requests from the staff interface. The holds slip is generated when a hold is confirmed and set to waiting. 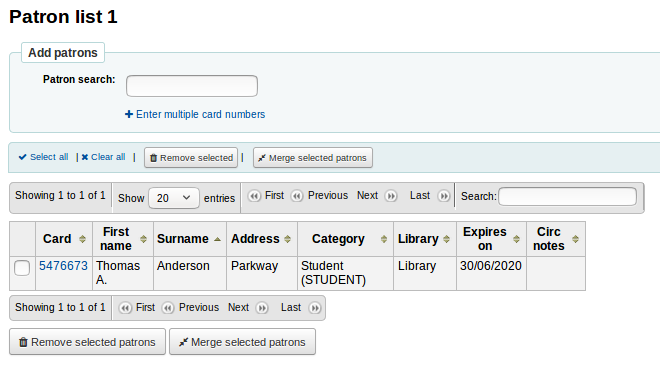 The overdues slip can be generated manually using the ‘print’ menu in the patron account in staff. It will show all items overdue. In order to send the overdue notices that you defined using the Notices tool, you need to first set the triggers to have these messages. 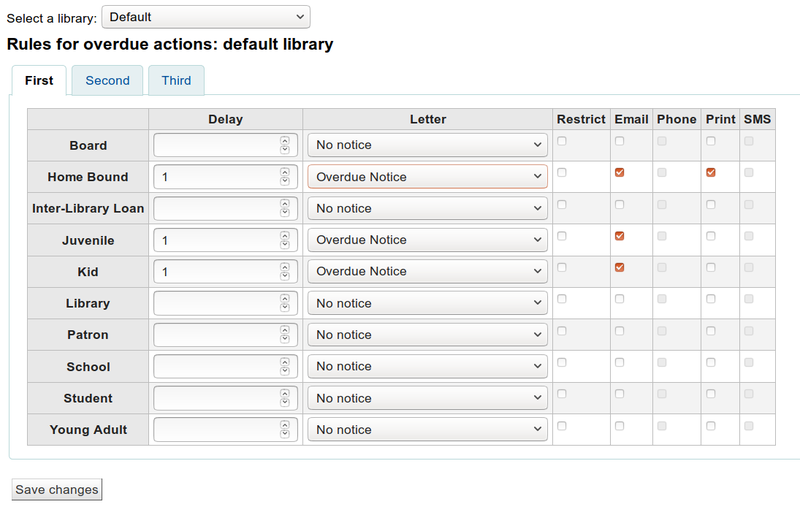 In order to have overdue notices sent to your patrons, you need to set that patron category to require overdue notices. Depending on the value of your OverdueNoticeCalendar preference the delay may or may not include days the library is closed based on the holiday calendar. Delay is the number of days after an issue is due before an action is triggered. If you want Koha to trigger an action (send a letter or restrict member), a delay value is required. If you would like to prevent a patron from checking items out because of their overdue items, check the ‘Restrict’ box, this will put a notice on the patron’s record at checkout informing the librarian that the patron cannot check out due to overdue items. If you choose to restrict a patron in this way you can also have Koha automatically remove that restriction with the AutoRemoveOverduesRestrictions preference. 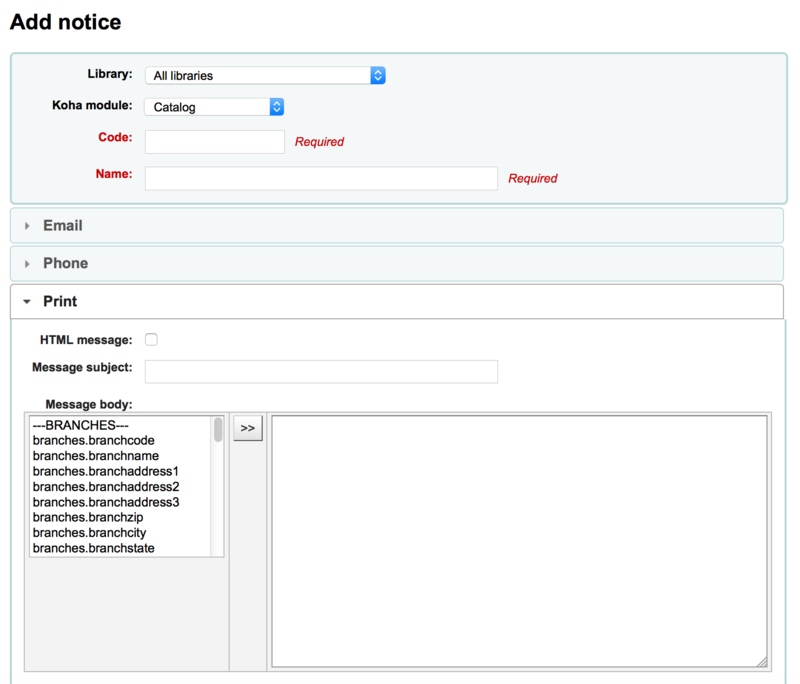 Next you can choose the delivery method for the overdue notice. You can choose from Email, Phone (if you are using the iTiva Talking Tech service), Print and SMS (if you have set your SMSSendDriver). A layout defines the text and images that will be printed on to the card and where it will appear. Up to three lines of text, the patron’s number in barcode representation and up to two images can be printed on to the card. 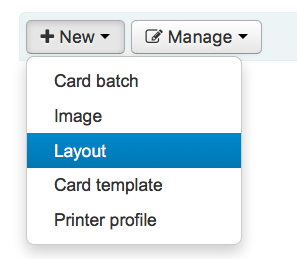 If you have no layouts defined, you will add a new layout by clicking the ‘New’ button and choosing ‘Layout’. You may also choose to press ‘Manage layout’ on the left side. Here you are offered a list of available layouts you can select for editing. But at the top of the page there is still the ‘New layout’ button. The Units pull down is used to define what measurement scale you’re going to be using for your layout. You will need a layout for both the front and back of your card if you have 2-sided library cards, this option doesn’t allow you to print two sided cards, just lets you track which side of the card you’re designing. In order to show the barcode and the patron card number you will need to check the ‘Print Card Number as Barcode’ option. This will turn the patron card number into a barcode. If you want the number to print in human readable format you will need to check the ‘Print Card Number as Text Under Barcode’ option. Finally you can choose up to two images to print on the card. One can be the patron image which you can resize to meet your needs. The other image can be something like a library logo or symbol that you uploaded using the ‘Manage Images’ module of the Patron Card Creator Tool. It is the designers responsibility to define textlines, barcode and images such that overlap is avoided. 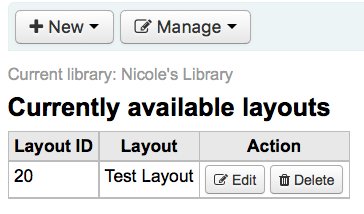 After saving, your layouts will appear on the ‘Manage layouts’ page. A template describes the arrangement of labels on the label sheet/card stock you are using. This might be Avery 5160 for address labels, Gaylord 47-284 for spine labels or Avery 28371 for your patron cards, just to give a couple of examples. All of the information you will need for setting up a template may be on the packaging, and if not it can usually be found on the vendor’s website or can be measured from a sample sheet. To add a new template click on the ‘New template’ button at the top of your page which brings you to the Edit template form immediately. You may also choose to press ‘Manage templates’ on the left side. Here you are offered a list of available templates you can select for editing. But in the top of the page there is still the ‘New template’ button. Using the form that appears after pressing either ‘Edit’ or ‘New template’you can define the template for your sheet of labels or cards. The Units pull down is used to define what measurement scale you’re going to be using for the template. The measurements (page height, page width, card width, card height) may be on the packaging, and if not it can usually be found on the vendor’s website or can be measured from a sample sheet. A profile is a set of “adjustments” applied to a given template just prior to printing which compensates for anomalies unique and peculiar to a given printer (to which the profile is assigned). 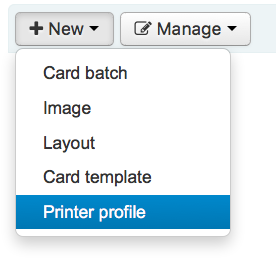 Before defining a profile try printing some sample cards so that you can take measurements to define a profile to perform the right adjustments for your printer/template combination. 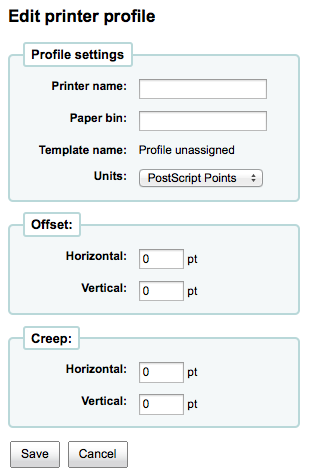 After finding and documenting any anomalies in the printed document, then you can create a profile and assign it to the template. Do not specify a profile unless needed, i.e. do not click to define a printer profile. It is not possible to remove a profile from a template but you can switch to another profile. If you are using different printers you may be required to define several templates that are identical only different profiles are specified. After saving, your templates will appear on the ‘Manage templates’ page. A profile is a set of “adjustments” applied to a given template just prior to printing which compensates for anomalies unique and peculiar to a given printer. 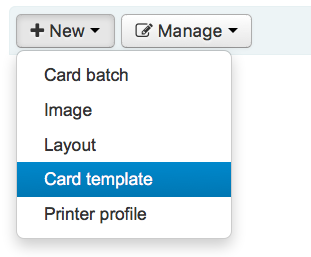 This means if you set a template up and then print a sample set of data and find that the items are not all aligned the same on each card, you need to set up a profile for each printer (or even different tray selections on the same printer) to make up for the differences in printing styles, such as the shifting of text to the left, right, top or bottom. If your cards are printing just the way you want, you will not need a profile. To add a new profile, you want to click on the ‘New profile’ button at the top of your page. 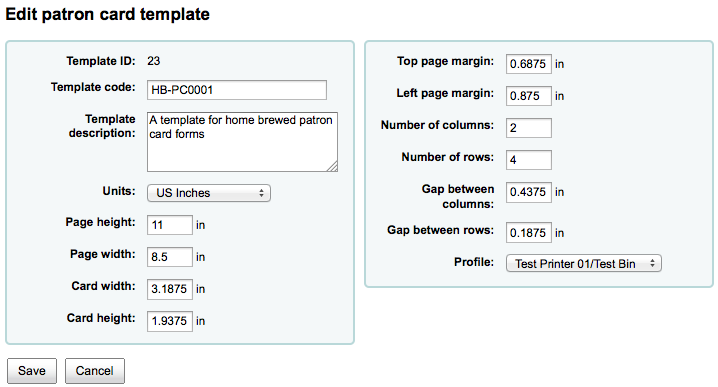 Using the form that appears you can define the values to correct the card misalignments on your label sheet. You may also choose ‘Manage profiles’ on the left side and select one of the currently available profiles for editing. The Printer Name and Paper Bin do not have to match your printer exactly, they are for your reference so you can remember what printer you have set the profile for. The Units pull down is used to define what measurement scale you’re going to be using for your profile. Example: the text is printed 0 .25” from the left edge of the first label, 0 .28” from the left edge of the second label and 0 .31” from the left edge of the third label. This means the horizontal creep should be set to (minus) -0.03 ” to make up for this difference. After saving, your profiles will appear on the ‘Manage Printer Profiles’ page. Once you have saved your new profile, you can return to the list of templates and choose to edit the template that this profile is for. A batch is a collection of patrons for whom you want to generate cards. 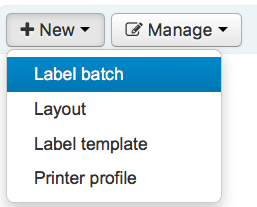 To add a new batch, you want to click on the ‘New batches’ button at the top of your page. Choosing the menu item ‘Manage batches’ on the left a list of already defined batches is displayed. In this display you can either select a batch for editing or add a new batch. For a new batch a message pops up and directs you to select patrons to be processed in this batch. 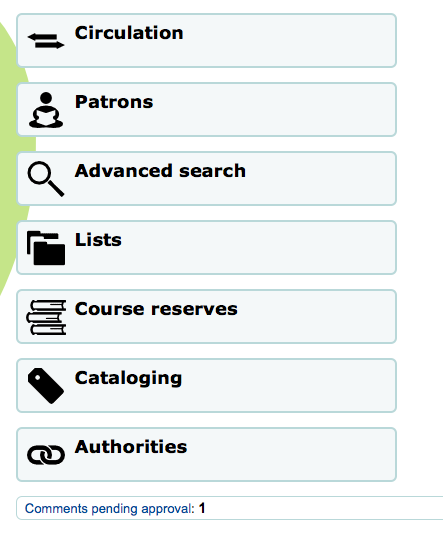 After choosing the ‘Add item(s)’ button the Patron Search window pops up. 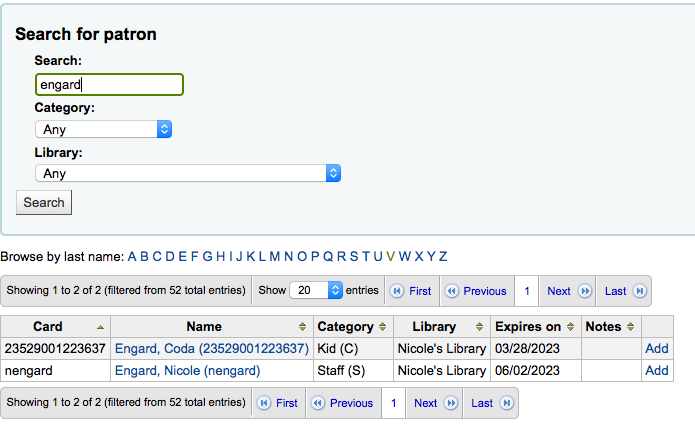 From here you can search for patrons to add to your batch by any part of their name, their category and/or library. Entering * in the search box will display all the patrons. From the results you can add patrons to the batch by clicking the ‘Add’ button. After adding patrons from the results you can start over and perform another search or click ‘Close’ at the bottom of the screen to indicate that you are done. You will then be presented with your batch. If you are satisfied with your batch you can proceed to export. If you want to correct or even delete that batch the buttons to do so can be found at the top of your screen. 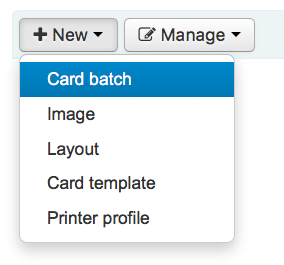 You can always come back here through the ‘Manage > Card batches’ button. 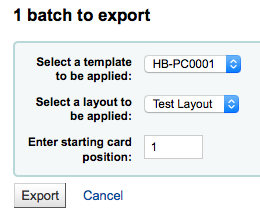 If you would like to export all patron cards you can click ‘Export card batch’ otherwise you can choose specific patrons to print cards for by checking the box to the right of their names and then choose ‘Export selected card(s)’ at the top. The export menu will ask you to choose a template, a layout and starting position (where on the sheet should printing begin). For the starting position if the first 6 labels have already been used on your sheet you can start printing on label in position 7 on the sheet. The labels are numbered left to right from top to bottom. The above image shows a layout that is made up of two textlines. The first one is just plain text, the second one is composed of the <firstname> <surname> fields. A patron image is printed (if available) and the barcode of patrons number is displayed in code 39. All this is printed on a template with three columns and 8 rows using position 1-3 here. When printing this PDF please take care that your printer doesn’t rescale the PDF (e.g do not fit to paper size) otherwise the printer will not be able to print to the right place per your templates. 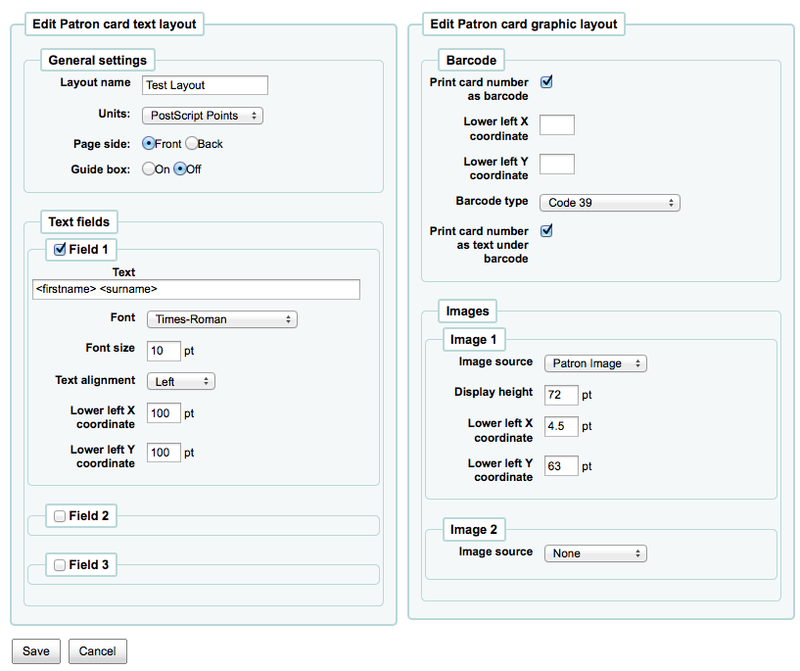 Images uploaded using this tool will appear on the menu when creating patron card layouts. You are limited in how many images you can upload (not counting patron images) by the ImageLimit system preference. Images must be under 500k in size. 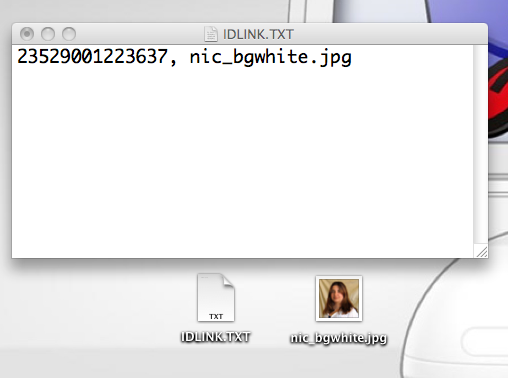 Pictures uploaded with this tool should be at least 300dpi which is the minimum quality for a printable image. In the center of the screen is a simple upload form, simply browse for the file on your computer and give it a name you’ll recognize later. Once the file is uploaded you will be presented with a confirmation message. And the image will be listed with all of your others on the right hand side of the page. To delete one or multiple of these images, click the checkbox to the right of each image you want to delete and click the ‘Delete’ button. 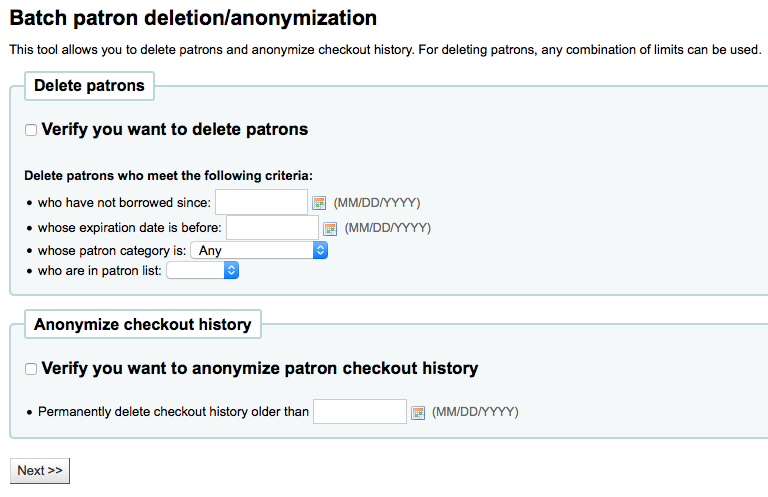 This tool allows you to bulk anonymize circulation histories (this means that you keep records of how many times items were checked out - but not the patrons who checked the items out) or bulk delete patrons (remove them from the system completely). Patrons with outstanding fines or items checked out are not saved. They are not completely removed from the system (they are only moved to the delete_borrowers table), but this tool does not provide as many checks as one may desire. Before using this tool it is recommended that you backup your database. Changes made here are permanent. The anonymization will fail quietly if AnonymousPatron preference does not contain a valid value. With this tool you can make edits to a batch of patron records. 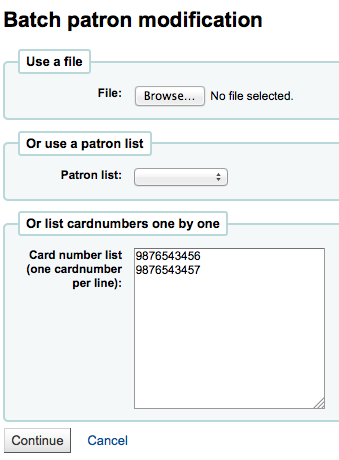 Simply load in a file of cardnumbers (one per line), choose from a list of patrons or scan patron card numbers in to the box provided. Once you have the file loaded or the barcodes scanned click ‘Continue.’ You will be presented with a list of the patrons and the changes you can make. To the left of each text box there is a checkbox. Clicking that checkbox will clear our the field values. If the field is mandatory you will not be able to clear the value in it. 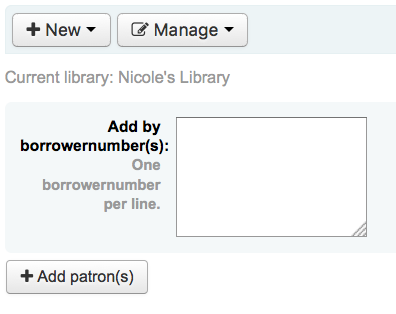 If you have multiple patron attributes you can change them all by using the plus (+) sign to the right of the text box. This will allow you to add another attribute value. Once you have made the changes you want, you can click ‘Save’ and Koha will present you with the changed patron records. From this list of titles you can remove a tag without outright rejecting it from being used in the future by clicking the ‘Remove tag’ button to the right of the title. 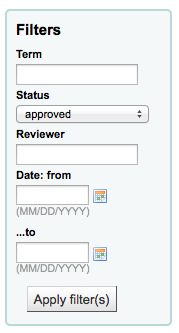 To approve a tag, you can either click the ‘Approve’ button in line with the term, or check all terms you want to approve and click ‘Approve’ below the table. To reject a tag, you can either click the ‘Reject’ button in line with the term, or check all terms you want to approve and click ‘Reject’ below the table. Once a tag has been approved or rejected it will be moved to the appropriate list of tags. A summary of all tags will appear on the right of the screen. Finally you can find tags by using the filters on the left. 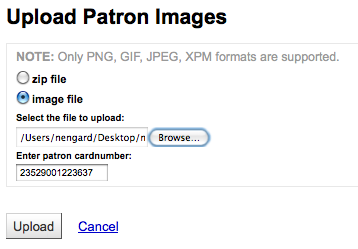 Patron images can be uploaded in bulk if you are allowing patron images to be attached to patron records. These images can also be used when creating patron cards. Make sure that your TXT file is a plain text document, not RTF. There is a limit of 100K on the size of the picture uploaded and it is recommended that the image be 200x300 pixels, but smaller images will work as well. Rotating Collections is a tool for managing collections of materials that frequently get shifted from library to library. It adds the ability to store not only an item’s home library and current location but also information about where it is supposed to be transferred to next to ensure that all items in the collection are sent to the correct library. When an item in a rotating collection is checked in, library staff is notified that the item is part of a rotating collection and which branch it should be sent to if it is not at the correct one. The AutomaticItemReturn system preference must be set to “Don’t automatically transfer items to their home library when they are returned” for Rotating Collections to function properly. To create a new rotating collection, click the “New Collection” button, fill in the Title and Description, and click Submit. Once submitted you’ll see “Collection Name added successfully”; click “Return to rotating collections home” to return to the main Rotating Collections management page (or click Rotating Collections in the sidebar). To add items to a collection, click “Add or remove items” next to the collection’s name in the list of collections. Under “Add or remove items” scan or type in the barcode of the item you wish to add to the collection, and hit Enter or click Submit if necessary. 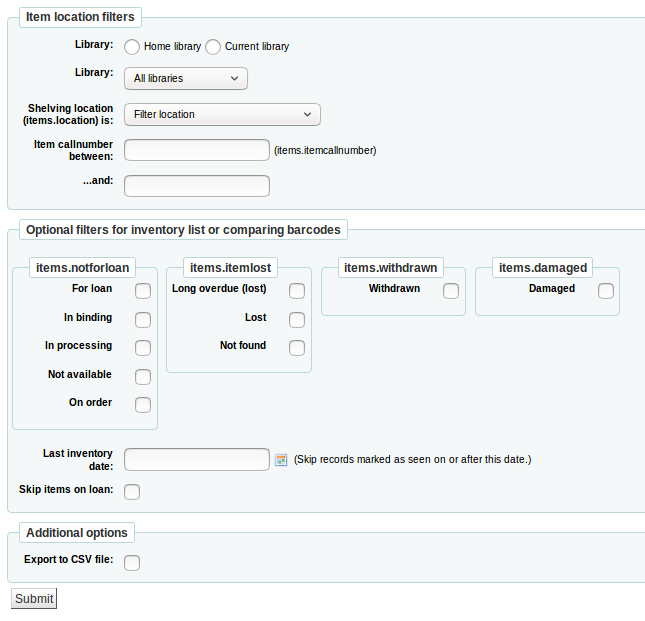 To remove an item from a collection, either click Remove next to the item’s barcode in the list of items within the collection or check the “Remove item from collection” box next to the Barcode text box under “Add or remove items, and scan or type in the barcode, clicking Submit or hitting Enter if necessary. Note: The “Remove item from collection” checkbox will remain checked as long as you are on the “Add or remove items” page, unless you uncheck it, to facilitate quickly removing a number of items at a time by scanning their barcodes. Initiate a transfer from its original current location/holding library to the current location/holding library it is to be rotated to. When a library receives a collection they will need to check in the items to complete the transfer. From the main Rotating Collections page, click on Transfer next to the title of the collection you wish to transfer; choose the library you wish to transfer the collection to and click “Transfer collection”. Or, from the “add or remove items” page for a collection, you can click the Transfer button, choose the library you wish to transfer the collection to and click “Transfer Collection”. In order to complete the transfer process, the library receiving the rotating collection should check in all items from the collection as they receive them. This will clear the transfer so that the items are no longer shown as being “in transit”. 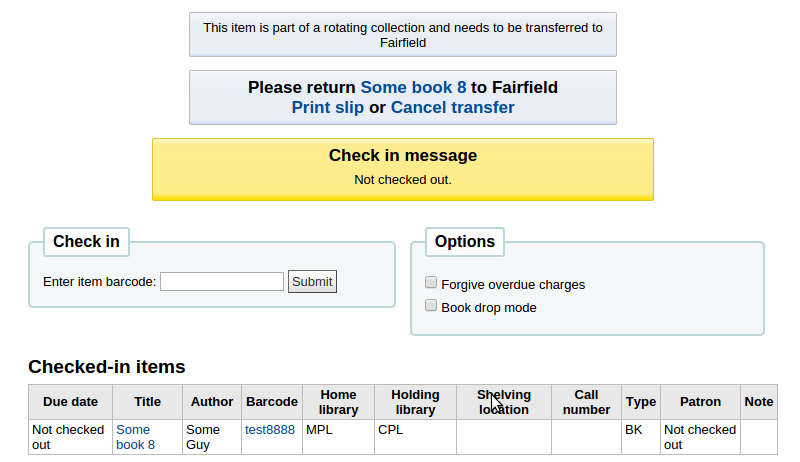 If an item in a rotating collection is checked in at a library other than the one it is supposed to be transferred to, a notification will appear notifying library staff that the item is part of a rotating collection, also letting them know where the item needs to be sent. This tool will allow you to delete a batch of item records from Koha. From the tool you can choose to upload a file of barcodes or item ids, or you can scan items one by one into the box below the upload tool. You will be presented with a confirmation screen. 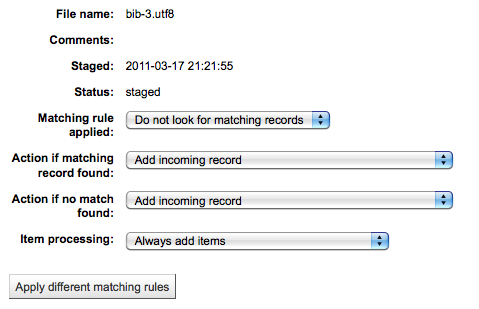 From here you can uncheck the items you don’t want to delete and decide if Koha should delete the bib record if the last item is being deleted before clicking ‘Delete selected items.’ If you’d like you can delete the bibliogrphic record if you’re deleting the last item by clicking the checkbox next to ‘Delete records if no items remain’. If your file (or list of scanned barcodes) has more than 1000 barcodes, Koha will be unable to present you with a list of the items. 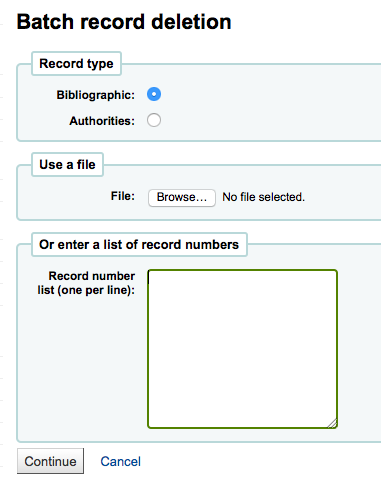 You will still be able to delete them, but not able to choose which items specifically to delete or delete the biblio records. If the items are checked out you will be presented with an error after clicking ‘Delete selected items’ and the items will not be deleted. If the items can be deleted they will be and you will be presented with a confirmation of your deletion. 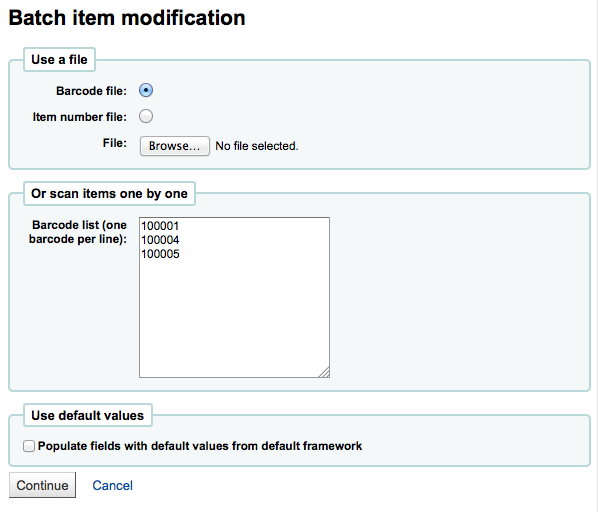 This tool will allow you to modify a batch of item records in Koha. From the tool you can choose to upload a file of barcodes or item ids, or you can scan items one by one into the box below the upload tool. You can also decide the items edited should be populated with the default values you have defined in your default framework. You will be presented with a summary of the items you want to modify. 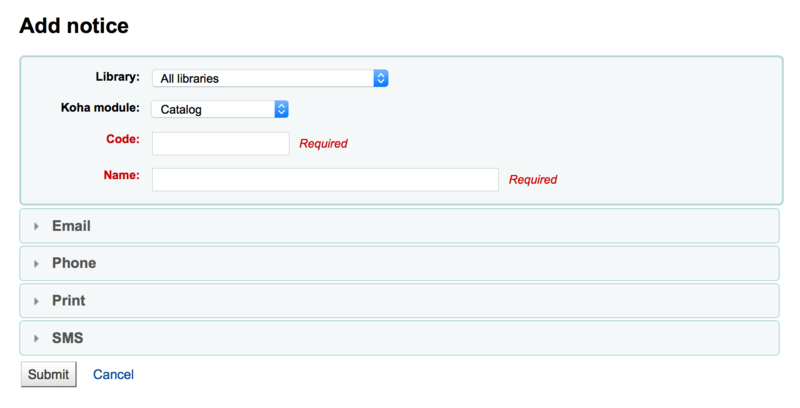 From here you can uncheck the items you don’t want to modify before making changes in the form below. You can also hide columns you don’t need to see to prevent having to scroll from left to right to see the entire item form. To uncheck all items thar are currently checked out you can click the ‘Clear on loan’ link at the top of the form. 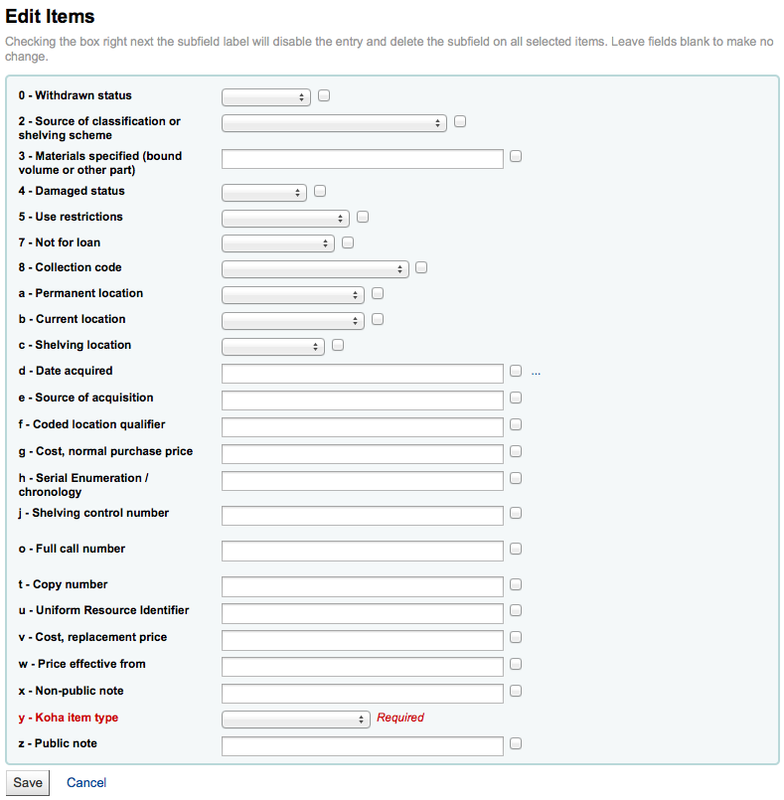 Using the edit form you can choose which fields to make edits to. By checking the checkbox to the right of each field you can clear the values in that field for the records you are modifying. Once you have made you changes you will be presented with the resulting items. This tool will take a batch of record numbers for either bibliographic records or authority records and allow you to delete all those records and any items attached to them in a batch. First you need to tell the tool if you’re deleting bibliographic or authority records. 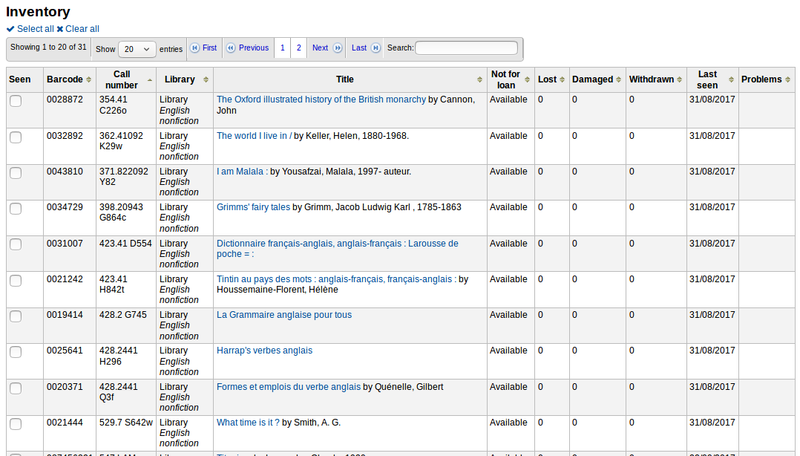 Next you can load a file with biblionumbers or authids or enter a list of those numbers in the box provided. Once you submit the form you will be presented with a summary of the records you are trying to delete. If a record you want to delete can’t be deleted it will be highlighted. Check the records you want to delete and click the ‘Delete selected records’ button to finish the process. 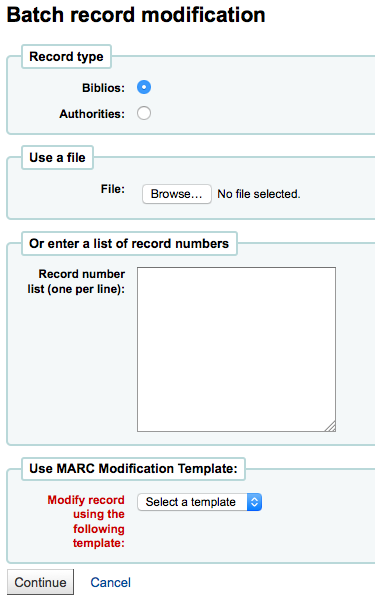 This tool will allow you to edit batches of bibliographic and/or authority records using MARC Modification Templates. Before visiting this tool you will want to set up at least one MARC modification template. 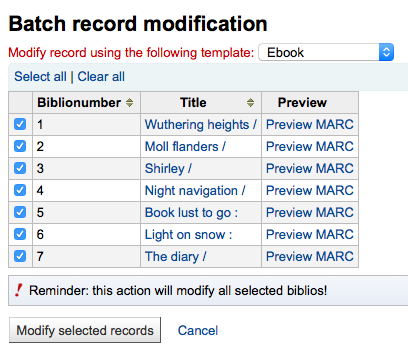 Finally choose the MARC Modification Template you’d like to use to edit these records. You will be presented with a list of records that will be edited. Next to each one is a checkbox so you can uncheck any items you would rather not edit at this time. Clicking Preview MARC will allow you to see what edits will be made when you finalize the edit. Once you’re sure everything is the way you want you can click the ‘Modify selected records’ button and your records will be modified. 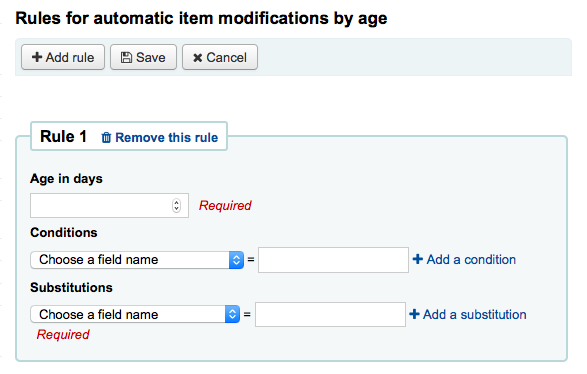 This tool allows librarians to update item specific fields when an item reaches a certain age. If you haven’t created any rules you will see the option to ‘Add rules’ on the Tool page. Click this button to create rules. Once you’re done you can click the ‘Add this rule’ link and then add additional rules or you can click the ‘Submit these rules’ button to save your changes. 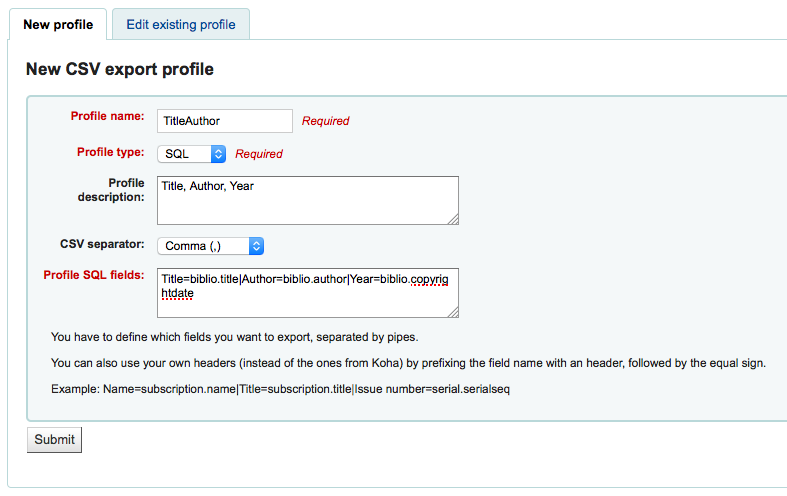 Koha comes with a tool that will allow you to export your bibliographic, holdings and/or authority data in bulk. This can be used to send your records to fellow libraries, organizations or services; or simply for backup purposes. At the top of the screen you need to pick what data you’re exporting. 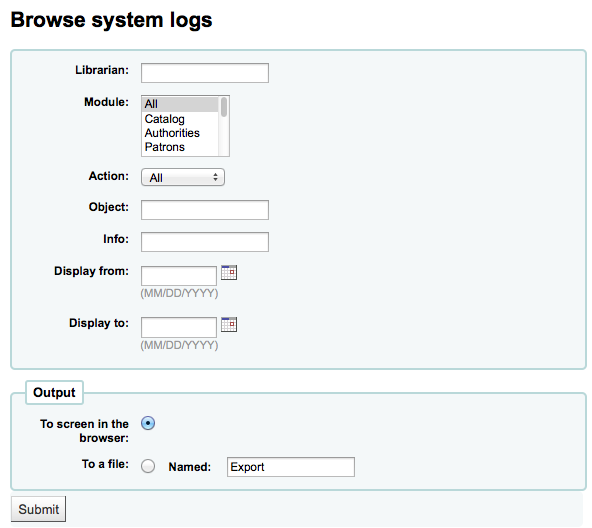 If you’re exporting bibliographic records with or without the holdings information you want to click the ‘Export bibliographic records’ tab. 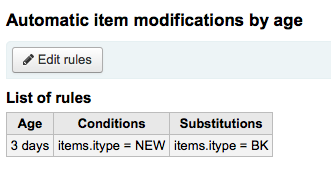 This limit will use the type you have defined in the item-level_itypes preference. If you have the item-level_itypes preference set to ‘specific item’ and you have no items attached to a bib record it will not be exported. 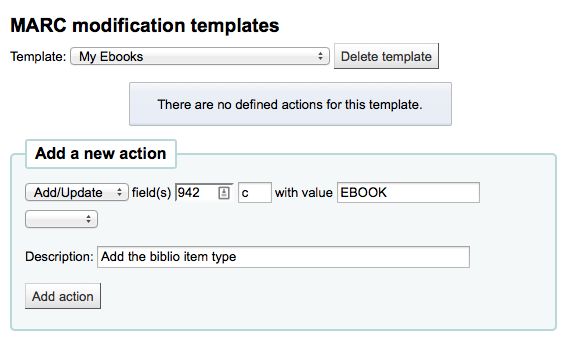 To get all bib records of a specific type you will need your item-level_itypes preference set to ‘biblio record’. This is a filter: if you leave this set to the default (all libraries selected) or select one or more libraries, bib records with no items attached will not be exported. To get bib records with no items you will need to ‘clear all’ (i.e. de-select all libraries). At the top of the screen you need to pick what data you’re exporting. If you’re exporting authority records you want to click the ‘Export authority records’ tab. By comparing a text file of barcodes gathered by a portable scanner to a generated shelf list. 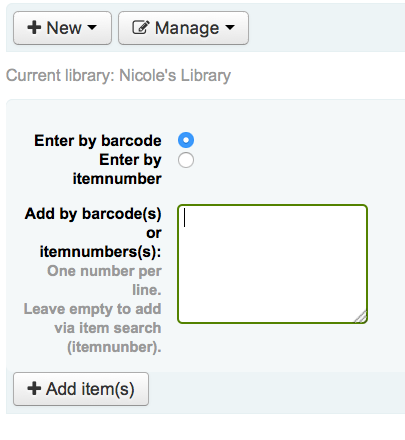 If you do not have the ability to use your barcode scanner on the floor of the library, the option available to you is to generate a shelf list based on criteria you enter. First, choose the criteria for the items you want to print out on a list. All parameters are optional, but if none are selected, the resulting list might be quite large. Library: choose the branch you want to check, as well as if that branch is the home library or the current holding library of the items. Shelving location (items.location) is: you can filter by location. 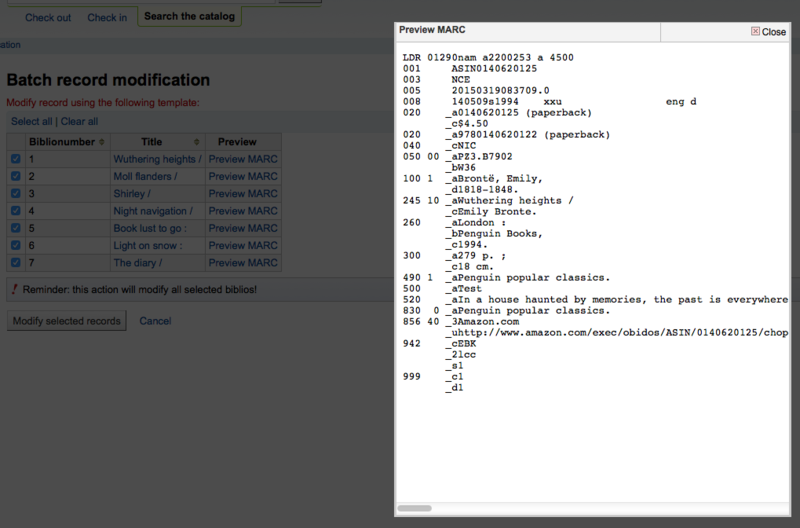 Item callnumber between … and …: you can also limit the list to a specific range of callnumbers. 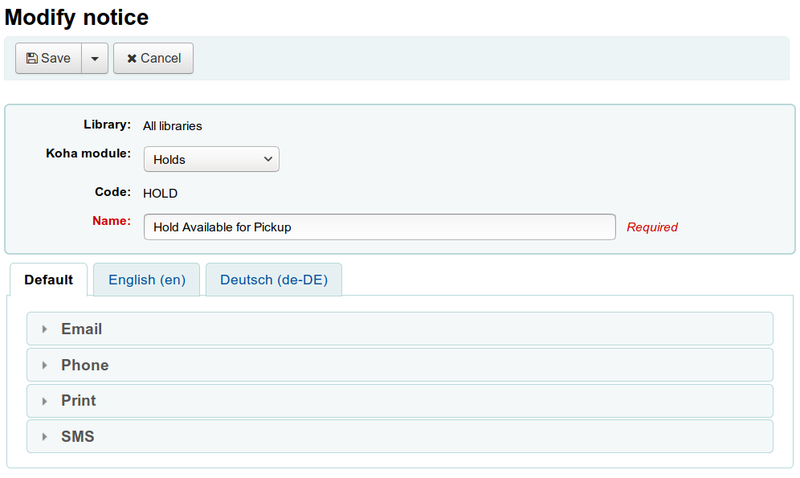 You can filter even more with item statuses (not for loan status, lost status, withdrawn status or damaged status). Check the boxes next to the statuses you want to include. For example, if you are using the list to shelf read, check only the ‘for loan’ status as the other items probably won’t be on the shelves. Last inventory date: enter a date here to skip items that have been marked as seen recently. 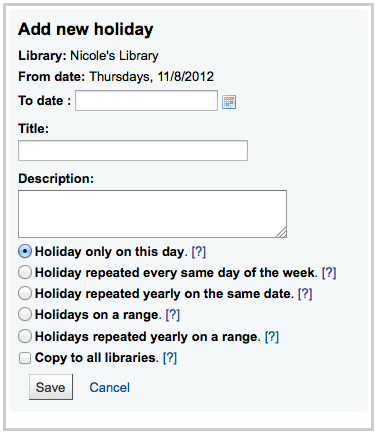 Skip items on loan: check this box to filter out loaned items from the list. Export to CSV file: check this box to generate a CSV file for altering in an application on your desktop. If this box is unchecked, the list will be presented on the screen. Click on ‘Submit’ to generate your shelf list. You can then print it to use while walking around the library checking your collection or use it directly in Koha on a portable device. 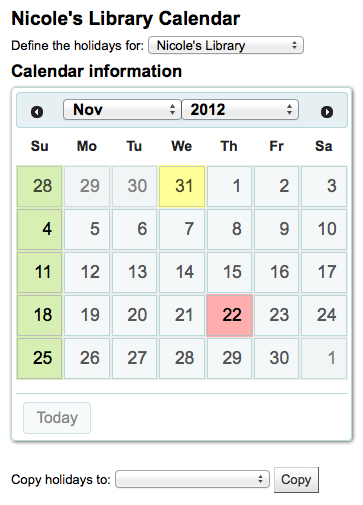 Mark seen and quit: updates the ‘last seen’ date of the checked items to today and returns to the previous screen. Mark seen and continue: updates the ‘last seen’ date of the checked items to today and shows the next page of the list. Continue without marking: doesn’t update any of the items on this page and shows the next page of the list. If you have a portable scanner (or a laptop and USB scanner) you can walk through the library with the scanner in hand and scan barcodes as you come across them (on a laptop, scan the barcodes into a text file). 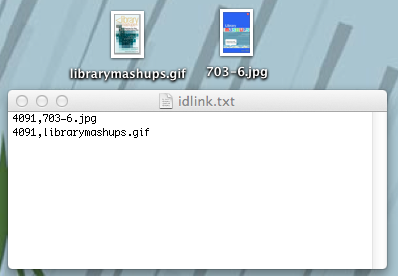 Once finished you can then upload the text file generated by the scanner to Koha. Choose the text file and the date you want to mark all items as seen and then scroll to the very bottom and click ‘Submit’. This will update all the items’ ‘last seen’ date to the chosen date. By default, this will also check in the items scanned as it is assumed that they are on the shelf and so not loaned out. If you do not want to check in scanned items, check the ‘Do not check in items scanned during inventory’ before clicking ‘Submit’. Alternatively, you can combine the two methods to automatically compare a list of scanned barcodes with a generated list. First, upload you barcode file and choose the date you want to appear in the items’ ‘last seen’ field. The ‘Compare barcodes list to results’ checkbox should automatically be checked. If you do not want the scanned items to be automatically checked-in if they are checked-out, make sure you check the ‘Do not check in items scanned during inventory’ checkbox. 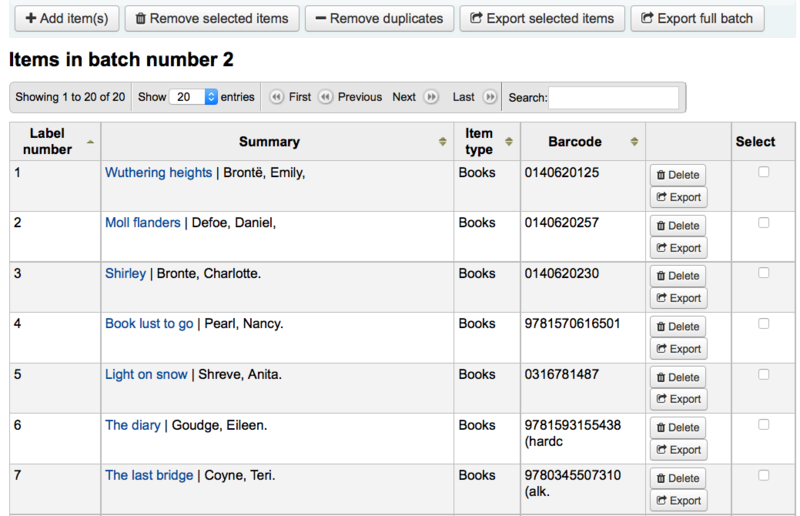 Choose the filters (library, shelving location, callnumbers or statuses) to generate a list with which to compare your barcodes. Click on ‘Submit’. Depending on the number of barcodes you are comparing, this may take a few minutes. It is not recommended to compare lists of more than 1000 barcodes as this may cause a session timeout. Once Koha has finished comparing the barcodes file to the generated list, it will return the number of items updated and a list of problematic items. 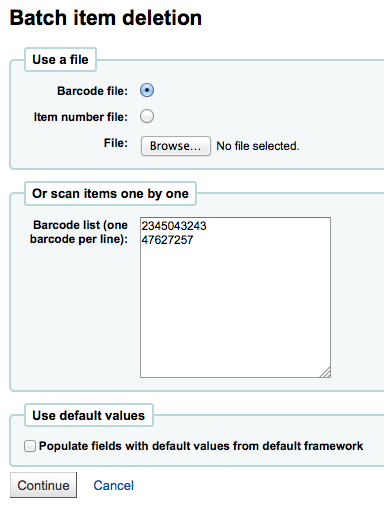 Missing (not scanned): the item is in the generated list but not in the barcodes file. Found in wrong place: the item is in the barcodes list, but not in the generated list. Still checked out: the item is checked out, but is in the generated list. It was not automatically checked in. Barcode not found: the barcode doesn’t exist. Item withdrawn: the item has ‘withdrawn’ status, but it is in the barcodes file. A template is based on the label/card stock you are using. This might be Avery 5160 for address labels, Gaylord 47-284 for spine labels or Avery 28371 for your patron cards, just to give a couple of examples. These labels will include all of the information you will need for setting up a Koha, this information may be on the packaging, and if not it can usually be found on the vendor’s website. 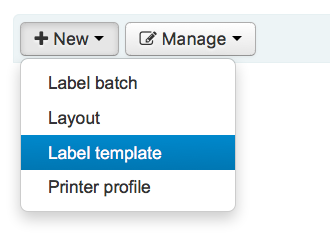 To add a new template, you want to click on the ‘New’ button at the top of the Label Creator and choosing ‘Label template’. 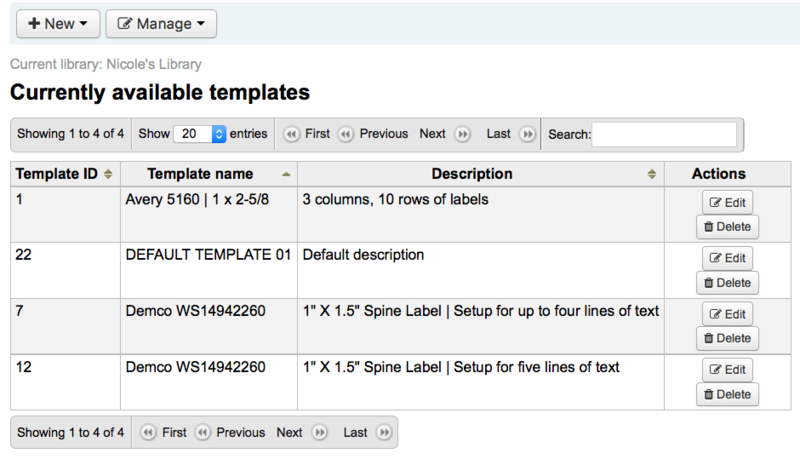 Using the form that appears you can define the template for your sheet of labels or cards. The Units pull down is used to define what measurement scale you’re going to be using for the template. This should probably match the unit of measurement used on the template description provided by the product vendor. The measurements, number of columns and number of rows can be found on the vendor product packaging or website. If you do not supply a left text margin in the template, a 3/16” (13.5 point) left text margin will apply by default. Before picking a profile try printing some sample labels so that you can easily define a profile that is right for your printer/template combination. 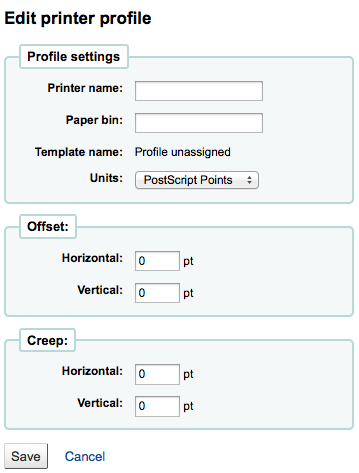 After finding any anomalies in the printed document, create a profile and assign it to the template. After saving, your templates will appear on the ‘Manage’ area under ‘Label templates’. A profile is a set of “adjustments” applied to a given template just prior to printing which compensates for anomalies unique and peculiar to a given printer (to which the profile is assigned). 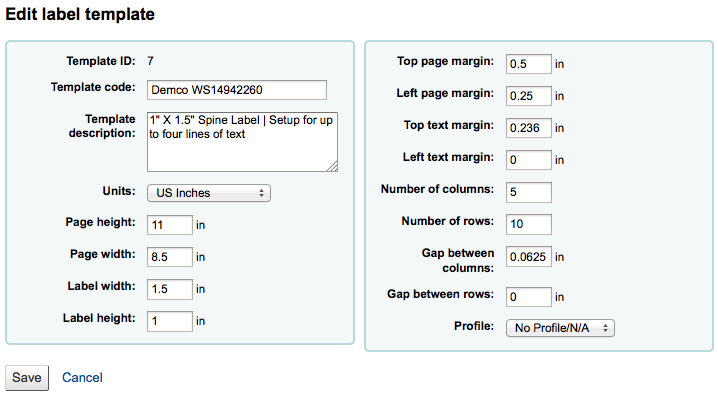 This means if you set a template up and then print a sample set of data and find that the items are not all aligned the same on each label, you need to set up a profile for each printer to make up for the differences in printing styles, such as the shifting of text to the left, right, top or bottom. If your labels are printing just the way you want, you will not need a profile. 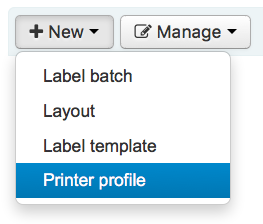 To add a new profile, you want to click on the ‘New’ button at the top of the Label Creator tool and choose ‘Printer profile’. Using the form that appears you can create a profile to fix any problems with your template. Example: the text is .25” from the left edge of the first label, .28” from the left edge of the second label and .31” from the left edge of the third label. This means the horizontal creep should be set to .03” to make up for this difference. After saving, your profiles will appear on the ‘Manage’ area under ‘Printer profiles’. 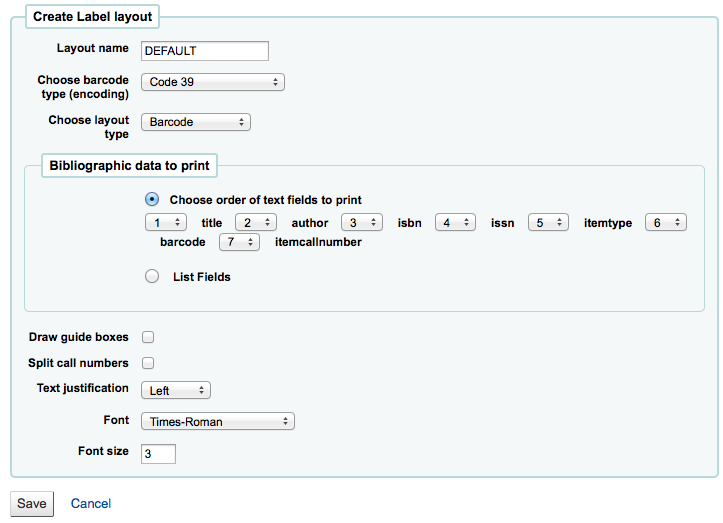 A layout is used to define the fields you want to appear on your labels. 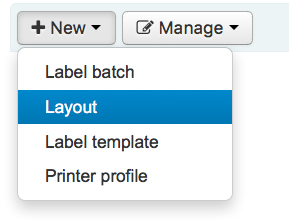 To add a new layout, you want to click on the ‘New’ button at the top of the Label Creator tool and choose ‘Layout’. The name of your layout can be anything you’d like to help you identify it later. 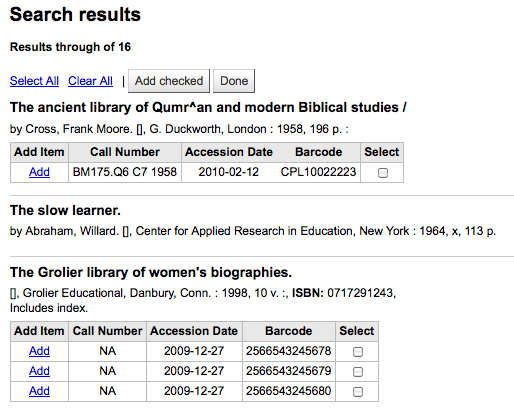 The layout type can be any combination of bibliographic information and/or barcode. For example a spine label would just be Biblio whereas a label for your circulation staff to use to checkout the book would probably be Biblio/Barcode. Finally choose your text settings such as alignment, font type and size. Batches are made up of the barcodes you would like to print. 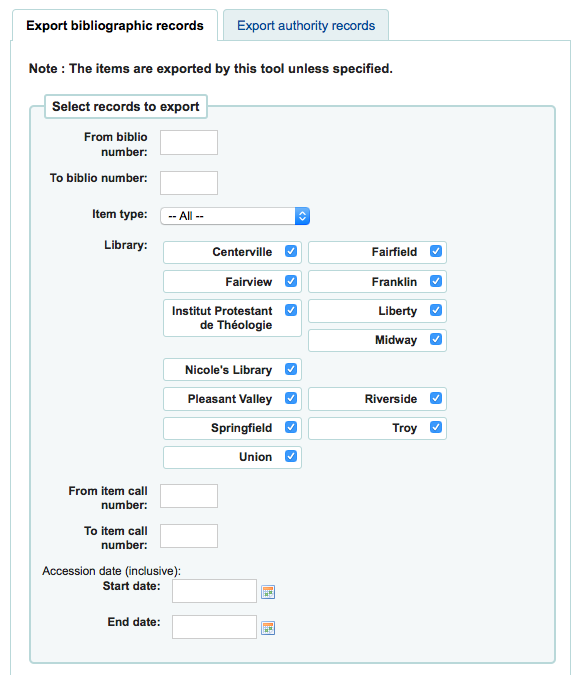 Once in this tool you can search for the item records you would like to print out labels for. You will be brought to an empty batch with a box to scan barcodes or itemnumbers in to and an ‘Add item(s)’ button at the bottom of the page. You can either scan barcodes in to the box provided and click the ‘Add item(s)’ button or you can click the ‘Add item(s)’ button with the barcodes box empty. Clicking ‘Add item(s)’ with nothing in the barcodes box will open a search window for you to find the items you want to add to the batch. From the search results, click the check box next to the items you want to add to the batch and click the ‘Add checked’ button. You can also add items one by one by clicking the ‘Add’ link to the left of each item. Once you have added all of the items click the ‘Done’ button. The resulting page will list the items you have selected. 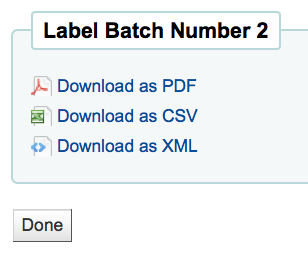 To print your labels, click the ‘Export full batch’ button. To print only some of the labels, click the ‘Export selected item(s)’ button. Either way you will be presented with a confirmation screen where you can choose your template and layout. You will then be presented with three download options: PDF, Excel, and CSV. After saving your file, simply print to the blank labels you have in your library. This tool does not use the label layouts or templates, it simply prints a spine label in the first spot on the label sheet. To use this tool you simply need the barcode for the book you’d like to print the spine label for. 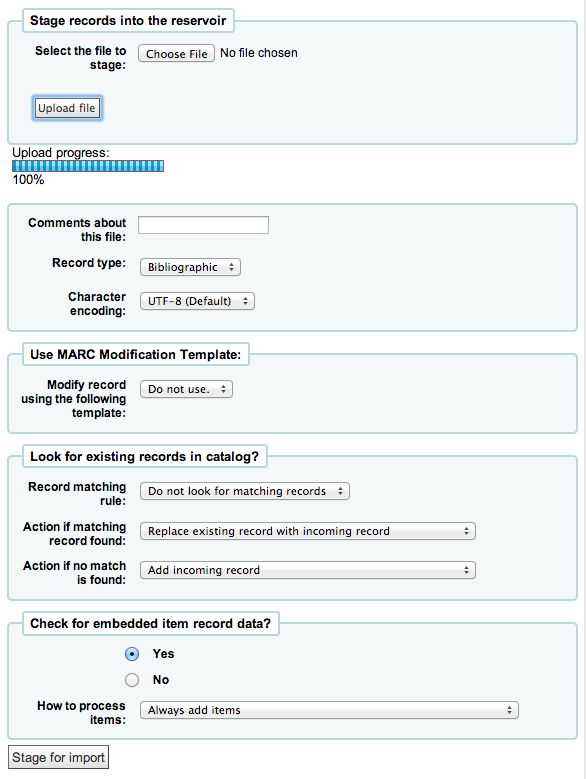 The MARC Modification Templates system gives Koha users the power to make alterations to MARC records automatically while staging MARC records for import. This tool is useful for altering MARC records from various vendors/sources work with your MARC framework. The system essentially allows one to create a basic script using actions to Copy, Move, Add, Update and Delete fields. Start by adding a new template (a template can be made up of one or more actions) by entering a name and clicking ‘Create template’. Next you can add actions to the template by filling in the Action box. 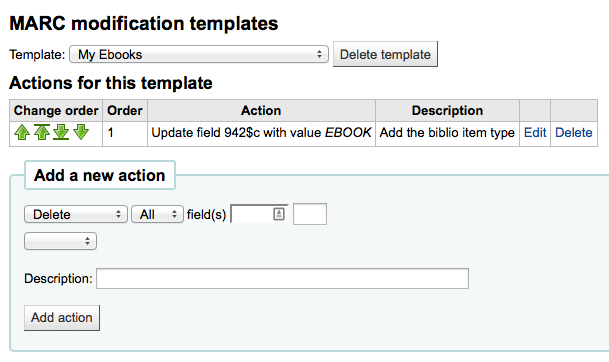 For example if you’re loading in a batch of files from your EBook vendor you might want to add the biblio item type of EBOOK to the 942$c. Each action can also have an optional condition to check the value or existence of another field. For example you might want to add the call number to the item record if it’s not already there. The Copy & Move actions also support Regular Expressions, which can be used to automatically modify field values during the copy/move. An example would be to strip out the ‘$’ character in field 020$c. The value for an update can include variables that change each time the template is used. Currently, the system supports two variables, __BRANCHCODE__ which is replaced with the branchcode of the library currently using the template, and __CURRENTDATE__ which is replaced with the current date in ISO format ( YYYY-MM-DD ). You could also use regular expressions to add your library’s proxy URL in front of links in your MARC record. 245 _aThe art of computer programming _cDonald E. Knuth. 300 _aThe art of computer programming _cDonald E. Knuth. Once your actions are saved you can view them at the top of the screen. Actions can be moved around using the arrows to the left of them. Depending on your actions the order may be very important. For example you don’t want to delete a field before you copy it to another field. To add another template you can either start fresh or click the ‘Duplicate current template’ checkbox to create a copy of an existing template to start with. Once your template is saved you will be able to pick it when using the Stage MARC Records for Import tool. This tool can be used to import both bibliographic and authority records that are saved in MARC format. 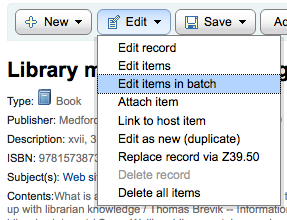 Importing records into Koha includes two steps. The first is to stage records for import. When using the ISBN matching rule Koha will find only exact matches. If you find that the ISBN match is not working to your satisfaction you can change the AggressiveMatchOnISBN preference to ‘Do’ and then run your import again. From here you can choose to always add items regardless of matching status, add them only if a matching bib was found, add items only if there was no matching bib record, replace items if a matching bib was found (The match will look at the itemnumbers and barcodes to match on for items. Itemnumbers take precendence over barcodes), or Ignore items and not add them. 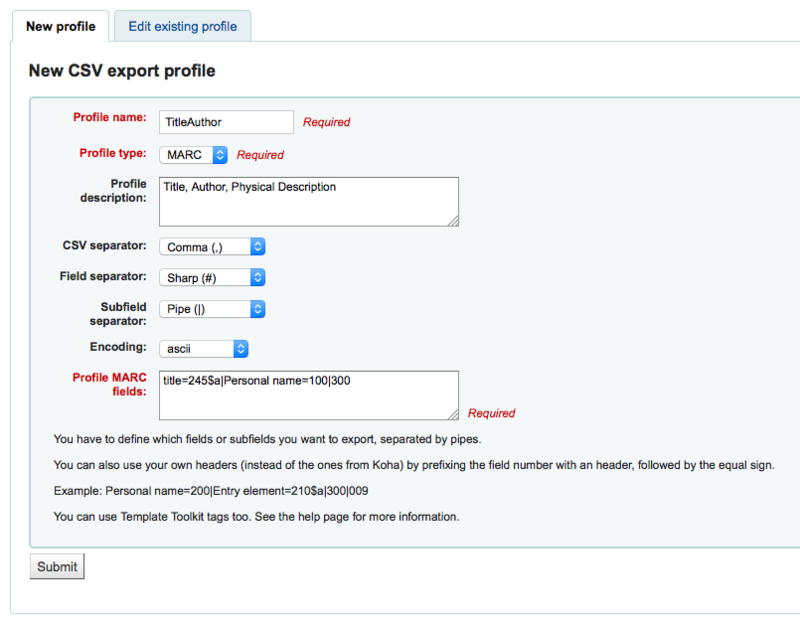 Once you have staged your records for import you can complete the import using this tool. Choosing a framework other than ‘Default’ isn’t necessary, but it’s helpful for running reports and having the right bib level item type selected on import. and when clicking the ‘View’ link under ‘Diff’ you can see the difference between versions. 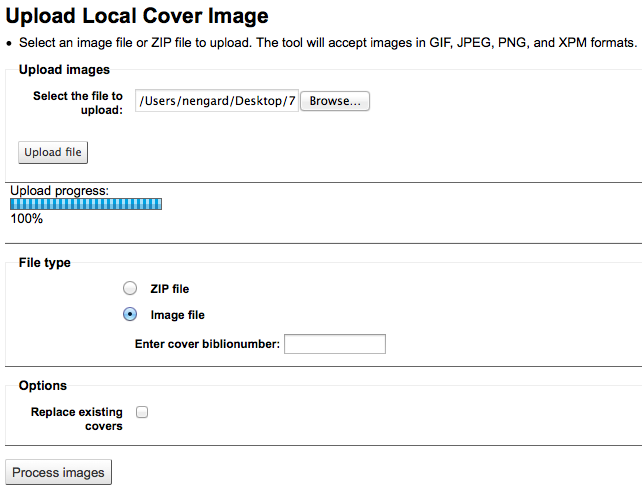 This tool will allow you to upload cover images for the materials in your catalog. To access this tool, staff will need the upload_local_cover_images permission. 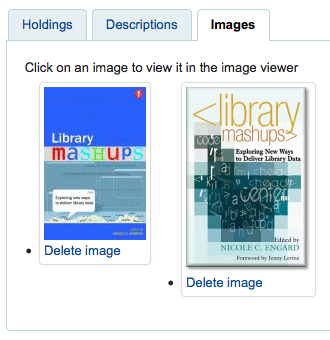 In order for images to show in the staff client and/or OPAC you will need to set your LocalCoverImages and/or OPACLocalCoverImages preferences to ‘Display.’ Images can be uploaded in batches or one by one. Koha does not have a maximum file size limit for this tool, but Apache may limit the maximum size of uploads (talk to your sys admin). When you want to upload multiple images onto a bib record, they will display left to right (then top to bottom, depending on screen real estate) in order of uploading, and the one on the left (the first one uploaded) will be the one used as a thumbnail cover in search results and on the detail page. There is no way to reorder cover images uploaded in this way, so be sure to upload them in the order you’d like them to appear. Visit the tool and click the ‘Browse’ button to browse to the image on your local machine. Enter the biblionumber for the record you’re attaching this image to. This is not the same as the barcode, this is the system generated number assigned by Koha. If uploading a batch of images at once you will need to prepare a ZIP file first. 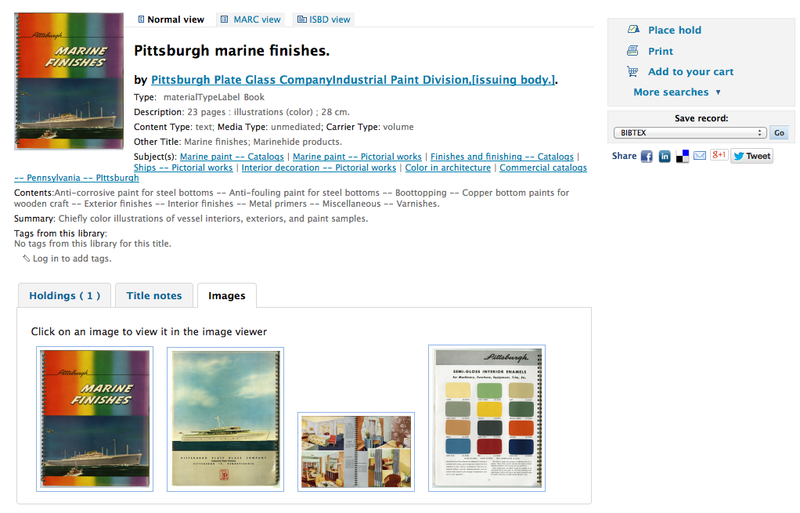 In the OPAC the cover images will also appear in the images tab, as well as next to the title and on the search results. If you would like to remove a cover image you can click ‘Delete image’ below the image if you have the upload_local_cover_images permission. Choose the method for calculating due date - either include days the library is closed in the calculation or don’t include them. Next you can choose if this event is a one time event or if it is repeatable. 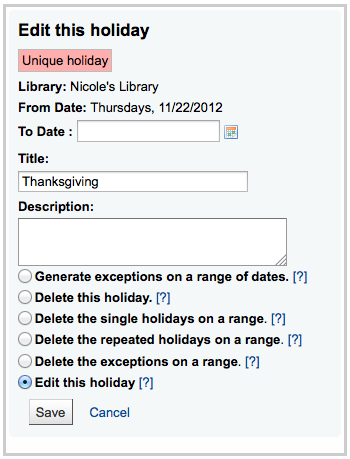 From this form you can make edits to the holiday or delete the holiday completely. All actions require that you click ‘Save’ before the change will be made. 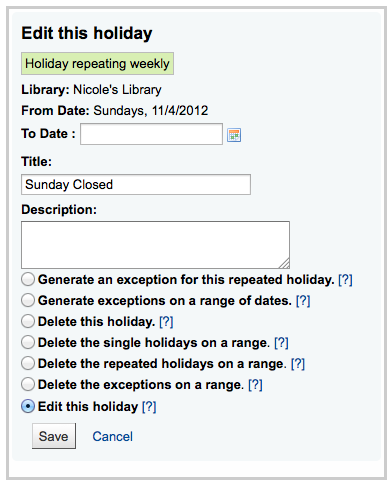 In the form above you will note that there is now an option to ‘Generate an exception for this repeated holiday,’ choosing this option will allow you to make it so that this date is not closed even though the library is usually closed on this date. 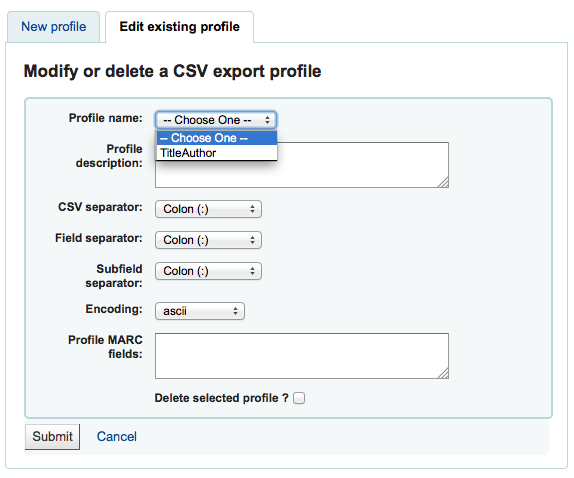 CSV Profiles are created to define how you would like your cart or list to export. The most common option here is comma because most spreadsheet applications know how to open files split by commas. When you have entered in all of the information for you profile, simply click ‘Submit’ and you will be presented with a confirmation that your profile has been saved. Once you have created at least one CSV Profile an ‘Edit profile’ tab will appear next to the ‘New profile’ button. Choose the profile you would like to edit and alter the necessary fields. Actions within the Koha system are tracked in log files. Your system preferences can be changed to prevent the logging of different actions. These logs can be viewed using the Log Viewer Tool. Choosing different combinations of menu options will produce the log file for that query. 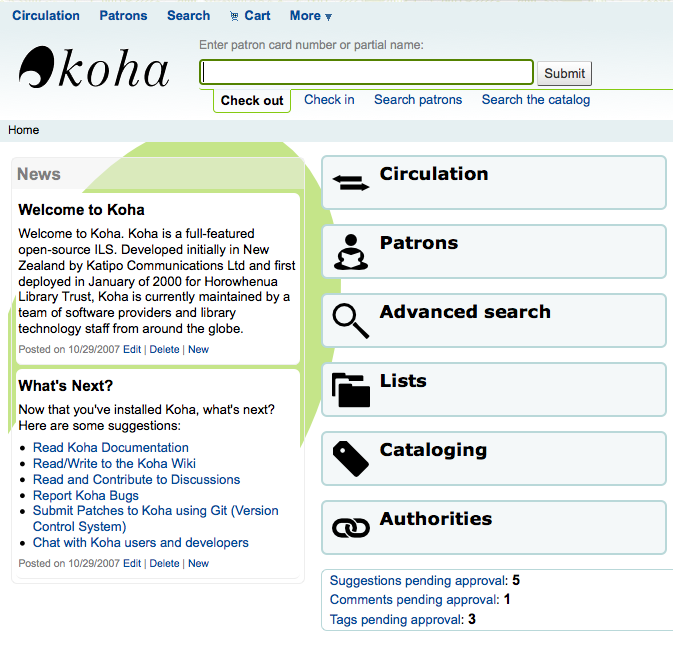 Koha’s news module allows librarians to post news to the OPAC, staff interface and circulation receipts. Under ‘Display Location’ choose whether to put the news on the OPAC, Slip (circulation receipt) or the Librarian (Staff) Interface. The task scheduler is a way to schedule reports to run whenever you want. Task scheduler will not work if the user the web server runs as doesn’t have the permission to use it. To find out if the right user has the permissions necessary, check /etc/at.allow to see what users are in it. If you don’t have that file, check etc/at.deny. If at.deny exists but is blank, then every user can use it. 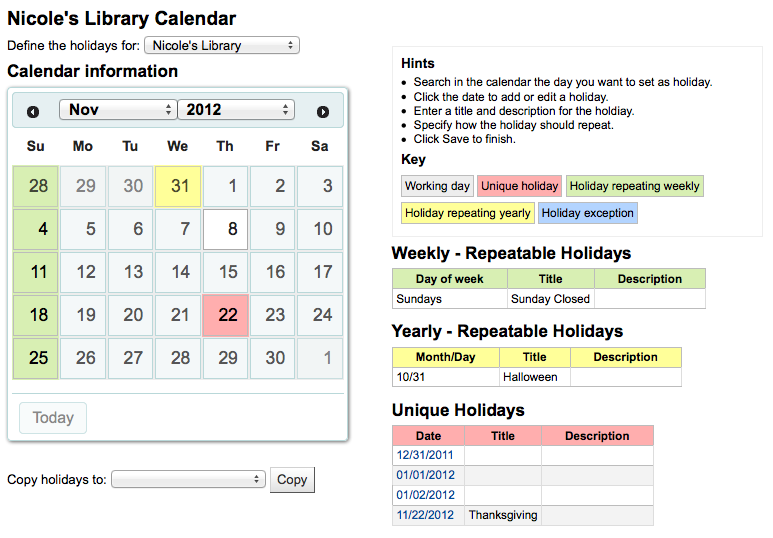 Talk to your system admin about adding the user to the right place to make the task scheduler work. This tool will allow you to add and edit quotes to show on the OPAC if you’re using the Quote of the Day (QOTD) feature. Click the ‘Add quote’ button in the toolbar and an empty quote entry will be added to the end of the current quote list. Both the ‘Source’ and the ‘Text’ fields must be filled in in order to save the new quote. When finished filling in both fields, press the <Enter> key on your keyboard to save the new quote. The list will update and the new quote should now be visible in the list. You may cancel the addition of a new quote any time prior to saving it simply by pressing the <Esc> key on your keyboard. Once the current quote pool has been loaded into the editing table, you may edit the quote source and text. Edit either the ‘Source’ or ‘Text’ fields by clicking on the desired field. When you are finished editing a field, press the <Enter> key on your keyboard to save the changes. The list will be updated, the edits saved, and visible. If you’d like you can also delete quote(s). 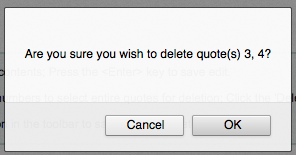 Select the quote(s) you desire to delete by clicking on the corresponding quote id. Once quote selection is finished, simply click the ‘Delete quote(s)’ button. You will be prompted to confirm the deletion. After confirming the deletion, the list will update and the quote(s) will no longer appear. If you’d like you can import a batch of quotes as a CSV file. Your file must contain two columns in the form: “source”,”text” with no header row. You will be prompted to confirm upload of files larger than 512KB. After selecting the CSV file, click the ‘Open’ button and the file will be uploaded into a temporary editing table. From the listing you can edit either the ‘Source’ or ‘Text’ fields by clicking on the desired field. When you are finished editing a field, press the <Enter> key on your keyboard to save the changes. You can also delete quotes from this listing before completing the import. Once quote selection is finished, simply click the ‘Delete quote(s)’ key. Once you are satisfied with the quotes, click the ‘Save quotes’ button in the toolbar at the top and the quotes will be saved. 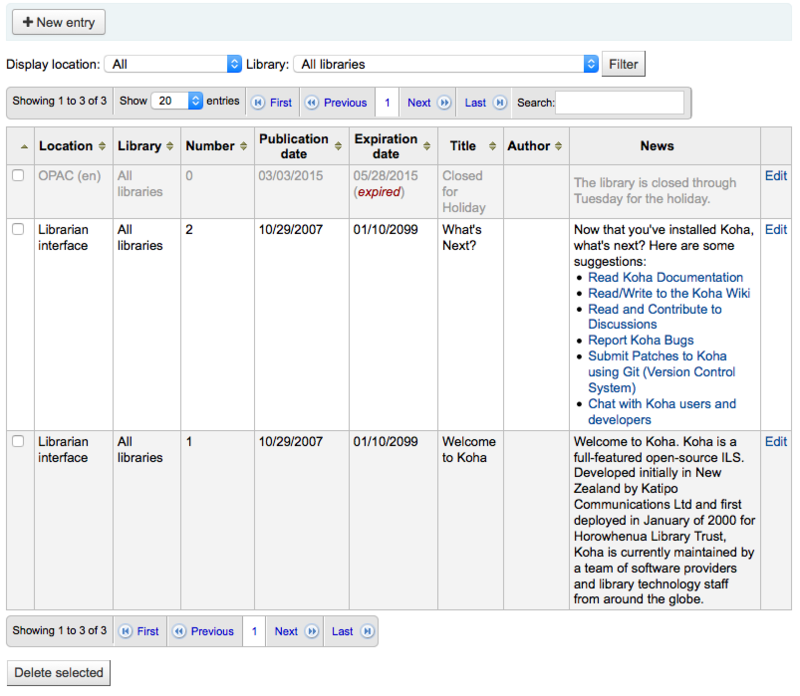 This tool will allow you to upload files to your Koha system for selection from the Cataloging form. When you first visit the Upload tool you might see a warning about missing a category. Categories are defined in the authorized value in the UPLOAD category. If you do not have upload categories then your files will be temporary and will be deleted the next time the server is rebooted. Once you have a value in the UPLOAD authorized value category you will see a Category pull down below the ‘Browse’ button. 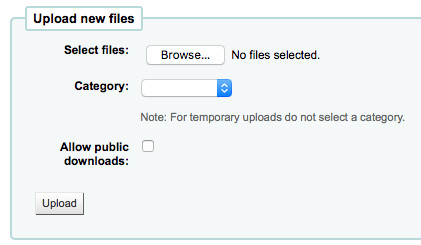 Browse your computer a file, choose a category and decide if the public will be able to download this file via the OPAC. Once your file is uploaded you will be presented with a confirmation. You will be presented with the results of your search. © Copyright 2017, Koha Community. Created using Sphinx 1.7.4.